Product code: ES8235 Categories: Modern & Retro Jewellery, Modern Rings & Engagement Rings. This ring certainly stands out on the finger and is sure to be admired every time that it is worn. Set with a beautiful natural 4.60 carat emerald, on each side there is a trilliant cut diamond that accentuates the ring perfectly. The entire ring is hand made in platinum and was made in London in 2016. The emerald has such a beautiful deep green with wonderful transparency that allows you to see right through the emerald and being set in platinum which is a pure white colour really helps to show off its amazing colour and size. The two trilliant cut diamonds total 1.12 carats and are F in colour and VS in clarity. The triangular shape of these diamonds suit this ring perfectly and from left to right the ring measures 19.3mm by 10.3mm wide at the centre. Sitting perfectly on the finger, this ring would easily suit any finger including making a wonderful engagement ring, and no matter the time of the day or night, this is one ring that will always stand out. 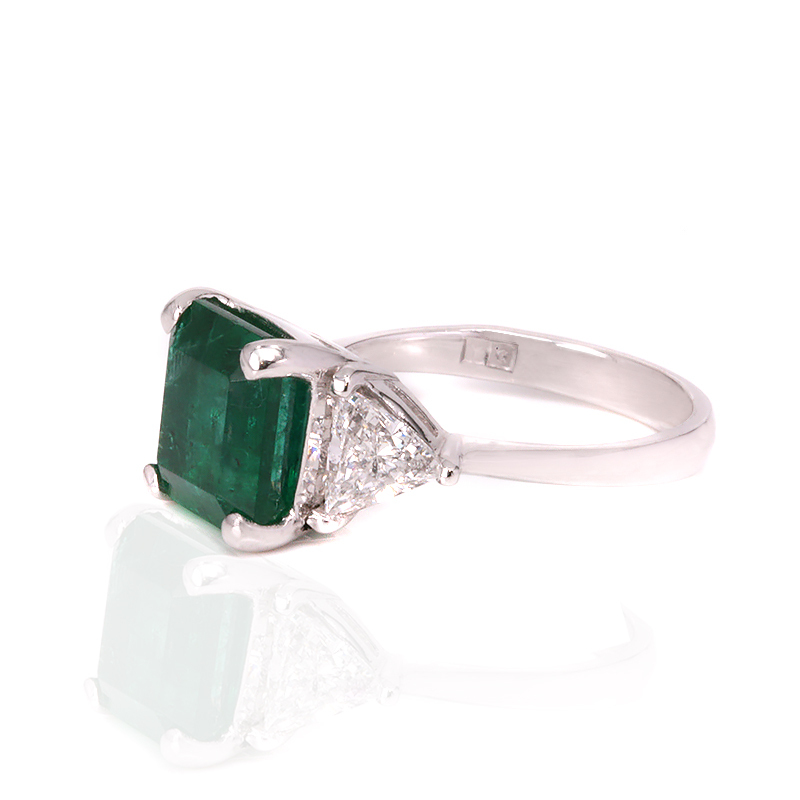 4.60 carat emerald and diamond ring set in platinum. 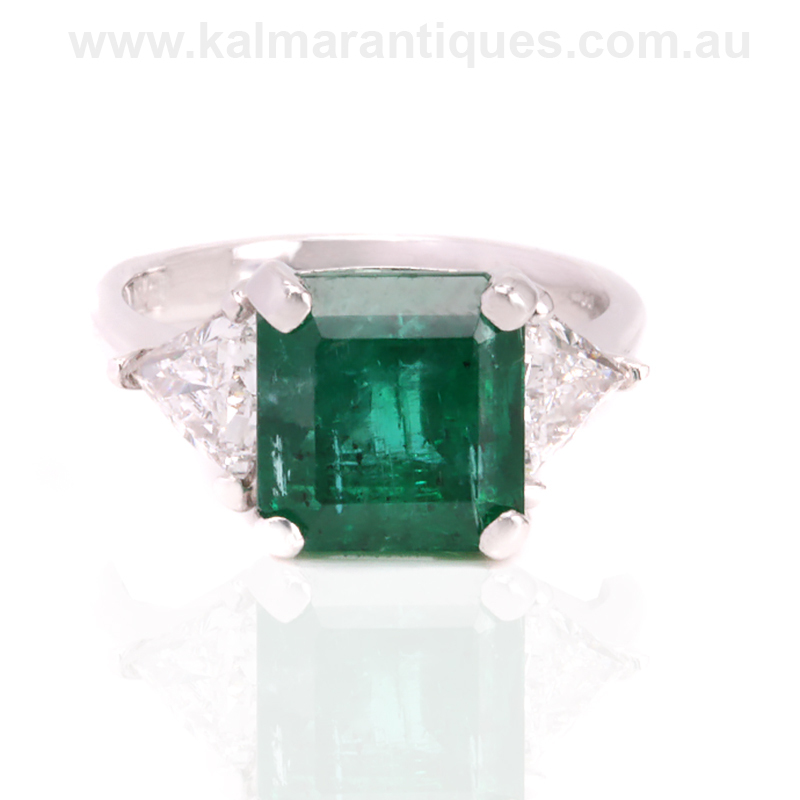 This emerald and diamond ring is set with a magnificent 4.60 carat natural emerald. Set on each side with trilliant cut diamonds, it is in a hand made platinum setting.